Hackney council is offering residents the chance to design their own Parklets to replace parking spaces on their streets. The trial was launched last week with two Parklets on show on Broadway Market, one of which was Meristem’s pop-up Parklet with trees. The scheme supports the installation of 15 parklets across the London borough. The trials will run from one to six months, after which the council will decide whether to make the parklets permanent. The council is offering successful applicants grants of up to £150 towards the cost of creating their parklets. Residents will have to cover any additional costs themselves. Cllr Feryal Demirci, Deputy Mayor of Hackney, said: “We’re delighted to deliver on our commitment to residents to launch a residential parklets scheme. This is in line with the ambition in our Liveable Neighbourhoods Plan to make sure that by 2025, Hackney has the most liveable and sustainable neighbourhoods and streets in London. 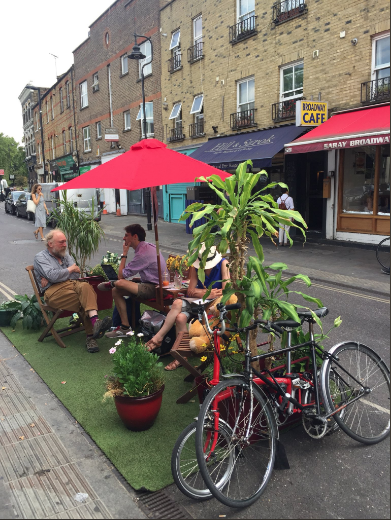 Contact us if you are a resident in Hackney and are applying for a community Parklet. We can design, supply and install a custom made Parklet for any budget!